Valentine’s day is right around the corner. Have you started getting ready yet? We are sticking with candy free Valentines again this year! Jokes have been going over so well at our house (Knock, Knock jokes are still the favorites) so I decided to make funny Valentine’s Day cards using some special Valentine’s jokes. Click here to download the printable Valentine’s Day Cards. What did the paint brush say to the paint? I love you with all my art. What did one pickle say to the other?You mean a great dill to me. What did the boy octopus say to the girl octopus? Can I hold your hand, hand, hand, hand, hand, hand, hand, hand? Why did the boy put candy under his pillow? Because he wanted sweet dreams. What is a vampire’s sweetheart called? His ghoul-friend. What do farmers give their wives on Valentine’s Day? Hogs and kisses! What did the bat say to his girlfriend? You`re fun to hang around with. 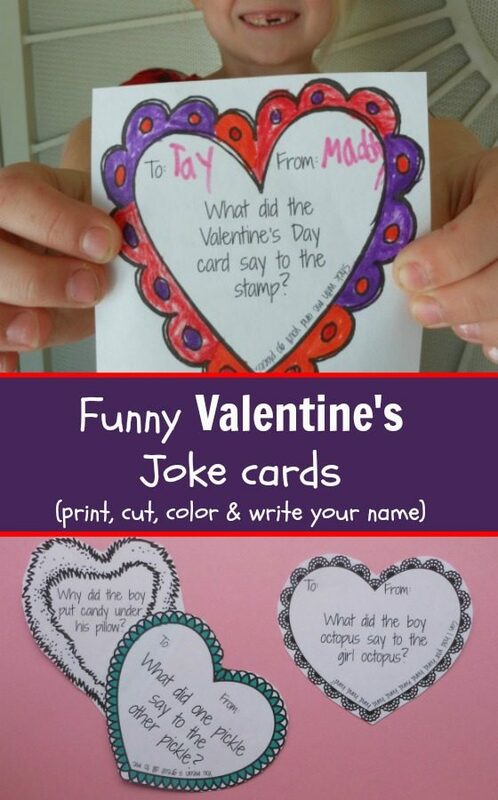 These Valentine jokes for kids make perfect printable Valentine’s Day cards. Print out the sheet on white paper and let your kids color in the hearts. Or use colored paper (maybe red or pink) so that all that’s left is to cut out the cards and fill out names. For sturdier cards, use card stock. You can also use these for jokes in your little one’s lunch box. Print them as is or write the jokes on a napkin. This post originally appeared on Feb. 5, 2015. I love these valentines cards! they are exactly what we were planning to make, but your printables are super fab so we are using them instead. thanks so much can’t wait to explore your site further.